Pomegranate liqueur like all other liqueurs is easy to make but you have to be patient and wait for the fruit to macerate in the alcohol for about a month, then prepare a simple sugar syrup and combine them. After that, you can drink it right away but as it matures it gets even better. I’ve written everything I know about making liqueurs in my post for Cherry Pit Liqueur, so if you have never made a liqueur before, I would advise you read that post before proceding further. There are several ways of getting the seed pods out of a pomegranate, one of them is shown in a video I made for my recipe How to make Easy Pomegranate Syrup. 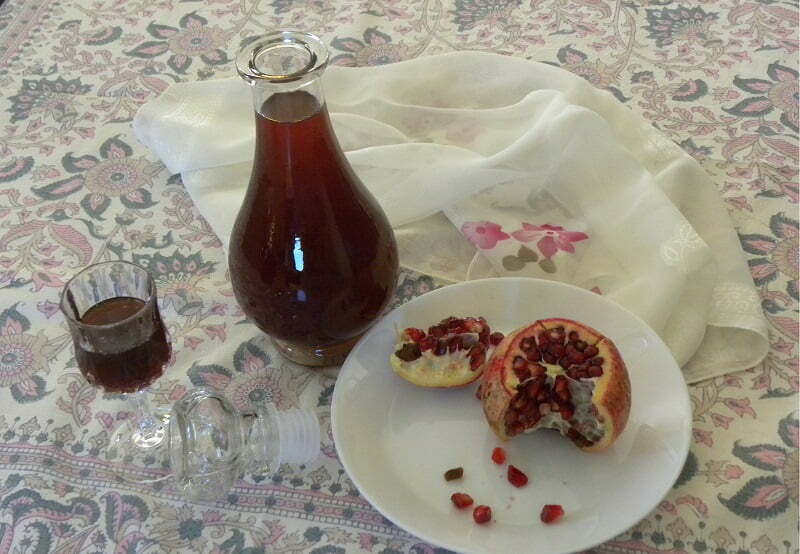 I started making this homemade pomegranate liqueur during December. Pomegranates mature from early October so, if you make it early, this ruby red liqueur makes an excellent Christmas gift! However, although it’s January, you can still find some pomegrates and make this wonderful liqueur, for yourselves, your guests or to gift it to your beloved ones. In our village, in Asini, Argolida, there are many pomegranate trees and we also have two growing in our garden. During November when we visited our village, there were still some pomegranates on the trees, which I picked and took with us to Athens. We ate a few of them at the beginning but because of the time commitment in retrieving the seeds, nobody else bothered eating them any more. One day in December, when I went to the farmers’ market, near my house in Athens, I saw a vendor selling tsipouro (an alcoholic drink made of pomace). I remembered the leftover pomegranates , so immediately I decided to buy a litre of tsipouro and make some pomegranate liqueur. There were four pomegranates left, which yielded 2 cups of seeds (also known as arils). As you see in the picture one of them has a deep ruby colour and the others were pinkish to red. It’s not that one was mature and the others were not but there are a lot of varieties of pomegranate and these were picked from two different trees. Be careful with the ruby ones as, if they stain your clothes, it’s difficult to clean and they will also colour your hands, so it’s preferable to wear an apron and latex gloves. I divided them in three jars and divided the alcohol in each one. I put them in the closet for a month (you can leave them more time if you like) and a few days ago, I made the syrup. At this stage, I wanted to experiment with making the pomegranate liqueur two ways. For the first and easiest one, I just emptied half of the steeped alcohol in a bowl and started adding some of my Homemade Pomegranate Syrup. I added the syrup gradually and tasted it until I was satisfied with the outcome. I used about 600 ml of pomegranate syrup. The amount of syrup to add depends on how sweet you like the final outcome. The same applies to the other method when making the syrup from scratch. For the second one, I made a simple syrup, which I flavoured with fragrant geranium leaves, because I love its delicate flavour. If you don’t have any, just make the syrup with sugar, water and lemon juice. If you want the syrup flavoured, you can add lemon peel, cinnamon stick, cloves, star anise, cardamom pods etc. This step is optional but when the syrup was ready, I added the leftover pomegranate seeds in the syrup and cooked it for one more minute. I did this to take out any leftover juice and alcohol, left in the pomegranate seeds. I then took a tea strainer and pressed the seeds with a spoon to extract whatever was left on the seeds. Again when the syrup cooled, I added it to the alcohol gradually, tasting it after each addition, until I was satisfied with the sweetness. Both liqueurs turned out great with minor differences. The first one has a hint of flavour from the spices which were in the syrup and the second one has the delicate flavour of the fragrant geranium. The recipe given below is for the whole amount of alcohol. Deseed the pomegranates and put them in a sterilized jar. Add the alcohol, seal with a lid and store in the closet for a month. Put the sugar with water in a small pot and mix until the sugar dissolves. Add the fragrant geranium leaves. Simmer for 7 - 8 minutes, add the lemon juice, mix and remove from the heat. At this stage, you can add the pomegranate seeds and cook for 1 more minute. Using a tea strainer remove the seeds, which press with a spoon to remove all the liquid. Boil for another minute and set aside to cool. Combine the syrup with the alcohol.